family fun Archives - FresYes! If you’ve ever spent time in downtown Fresno, odds are you’ve noticed the distinctive marquee and entrance of the Crest Theatre located on the southwest corner of Broadway and Fresno streets. Its wave-style signage and pastel coloring lend itself to the similar art deco style of beautiful local theaters such as Warnors and Tower. According to the theater’s website, The Crest was built in 1948 by Fox Theaters, and was owned by Mel Brooks and Ann Bancroft. In 1996, it was purchased by Gloria León and since then it has been home to numerous events from film screenings to church services, concerts, and dance performances. While researching fun things to do during the month of December, I discovered that The Crest is now hosting holiday movies each weekend throughout the holiday season! This first December weekend, following the 88th Annual Fresno Christmas Parade, The Crest held a free showing of the modern family classic, The Santa Clause, and I couldn’t resist the opportunity to get a peek inside this theater that has always captured my curiosity. So, after the parade and a delicious lunch thanks to the food trucks at Tioga-Sequoia’s Funky Christmas event, my family and I headed over. We were greeted by an employee at the door and a concessions booth in full swing. The smell of popcorn wafted through the air and excited kids hurried up the ramps into the theater entrances, located on either side of the concession area. I made a quick trip to the restrooms before finding my seat (more out of desire to further explore the building than anything else) and found myself in a round room fully surrounded by mirrors. Neat! Once in the main theater, the artistic reliefs in the room’s ceiling and on the walls captured all of our attention. They don’t make theaters like The Crest anymore, that’s for sure. The theater has been fitted with a 42 foot screen and surround sound (though I will say it’s not quite as loud as today’s typical theaters are, but maybe that was on purpose during this kid-friendly movie showing). There is plenty of seating, as the room can accommodate up to 1,200 guests, though I will advise you to sit in a row without others directly in front of you, as the seats and rows are reflective of the era, and designed smaller than today’s multiplex chairs. If you’re taller than me (5’4”), you’ll likely need the room to be able to stretch your legs in front of you. Parking wasn’t difficult. We found a spot on Fulton Street nearby with no issue, and meters aren’t enforced after 6 p.m. on Fridays or on weekends. The theater is beautiful, and definitely a fun experience, especially if you enjoy exploring old, historic buildings like I do. If you’d like to take in a holiday movie with your family and friends this December, you’ll have that chance every Friday and Saturday. Tickets are $5 each, with the exception of How the Grinch Stole Christmas, which is a FREE showing. Visit The Crest’s Events page on Facebook for full details, and enjoy! Something sweet is happening in downtown Fresno this weekend. If you like candy and games, grab a friend and head to Piñata Fest at Arte Américas. It’s a brand new festival featuring music, food, games, and lots and lots of piñatas. Who doesn’t love a good piñata? It’s practically a birthday party requirement in these parts. However, there’s more to a piñata than colorful paper, candy, and cardboard. According to Albee Sanchez of Sanchez Productions, the piñata’s history is relatively unknown. “Piñatas were originally created as a way for mortals to bash away their sins. The original piñatas from Mexico started as clay pots; however, over time, they gained the new ‘star shape’, a sphere with seven points. These points represent the seven deadly sins: greed, gluttony, sloth, pride, envy, wrath, and lust. Of course, most people today don’t use piñatas for their original functions, but Piñata Fest has the goal of mixing tradition with modernity. Throughout the day, piñata bashes will occur. If you don’t like hitting things with sticks, I guess that is fine. There’s plenty of other stuff to do. For example, you could try your hand at lotería (which is a Mexican card game similar to bingo). There will also be a DJ, live music, folklórico, and salsa dancing from Enchílate Salsa group. Speaking of salsa (the other kind of salsa), there will be lots of delicious food for you to choose from, not to mention piñata candy. Additionally, craft vendors will be there selling awesome local wares, and oversized yard games will be on hand for all your giant yard game needs. If you’re worried about getting hot, there’s even a water balloon toss. It’s really not a party until you have a giant piñata and a mariachi band. Usually when I write about local events, I decide I want to go after talking about the first few activities. I guess I don’t need much convincing — it usually only takes food and some music to get me to mark my calendar. That’s why it always impresses me that many of our local festivals are so jam-packed with awesomeness (see also: my post on this weekend’s Horned Toad Derby in Coalinga). I’ve told you about Piñata Fest’s music, food, and games — but there’s more! Come meet the largest piñata on the West Coast and let Pablo the Downtown Fresno Piñata inspire you to create your own. Sign ups are happening now for piñata making classes, where Abigail Janzen will walk you through the finer points of piñata making. Tickets for classes are going fast, so click here to reserve your spot. Pablo the Downtown Fresno Piñata, keeping his eye on the alley… wall. The goal of this event is to celebrate traditions in a modern way, and so far it seems like the Piñata Fest is on track to do just that. So, if you want fun with a dose of heritage, head downtown and enjoy our valley’s culture. When: Saturday, May 27, from 1 to 9 p.m. Kids 8 and under are free. General admission is just $3 at the door. Piñata class sign ups are here and cost $12. It’s $10 to enter into the piñata competition. Hourly piñata bashes are free with admission and are divided into age groups. The event Facebook page is here. I’m a huge fan of Disneyland. Really huge. I’ve even written a book about it. So I thought with the summer season starting this week, it might be fun to do a guide showing what’s arriving at, or coming back to, Disneyland in summer 2017. Truth be told, there isn’t a whole lot that’s new to the original magic kingdom itself, but it’s a different story for the park across the esplanade. Disney California Adventure (DCA) will be taken over by superheroes, so expect to see a bunch of characters in tight, Spandex costumes (maybe you expect that already). Over at Disneyland proper, you’ll find the return of some old favorites, plus additions to existing attractions and some new food selections. Ready? Here’s what’s happening at the Disneyland Resort summer 2017. Guardians of the Galaxy Mission: BREAKOUT! Guardians of the Galaxy Mission: BREAKOUT! is the cornerstone of Disney’s big Summer of Heroes promotion (more on that in a sec). It’s not a new ride, exactly — the ride operation is the familiar elevator drop-style from Tower of Terror. The theming, though, from outside to inside, is entirely different. The story is now centered around the Collector, who is holding the Guardians hostage in his fortress. Rocket Raccoon has escaped and needs the help of those visiting the fortress to rescue his friends. There has been a lot of talk in the Disney fan community about the change from haunted hotel theme to what is now essentially a ride promoting a summer movie. Time will tell on if GoTGM:B will become a classic Disney attraction. For the time being at least, expect this one to be crazy-crowded with long lines. Details: Opens May 27. Guests must be 40″ tall to ride. As I mentioned above, the Summer of Heroes is Disney’s big promotional push for the summer. It runs May 27 to September 10, and in addition to the Guardians ride, will include various meet-and-greet and (of course) shopping opportunities. A couple of years ago, Disney realized it was short on things to do in the Hollywood Land area of DCA. It opened up one of its show buildings, tossed in a DJ and some characters, and created a dance party. It was a perfect opportunity for tired parents to sit as their kids, hopped up on sugary theme park treats, tired themselves out. The GoTG: Awesome Dance-Off kinda sounds like that, but with characters and music from GoTG. Star-Lord, Gamora, and Groot will be around for this one. Details: For kids and tweens. Apparently Groot will be available for photos, but not the other characters. If you’ve ever seen the Jedi Training at Disneyland, you already know what this is about: kids ages 4-12 sign up to be trained by Black Widow and Hawkeye from the Avengers. I always enjoy watching the Jedi show, so hopefully this one will be as fun. Details: Availability is limited. Sign up first thing in the morning when the park opens to get your kid a spot for this. Show times throughout the day will be listed on the Disneyland app. It’s about time Black Widow got her own meet-and-greet; Captain America and Spider-man have been in the park for awhile now. Unlike those other Avengers, Black Widow is getting a grand entrance: apparently, she rolls up to her designated photo spot in an armored vehicle. You can still meet Cap and Spidey, too (they all have separate lines, so be prepared to stand there for each character for some time). Sounds like a quiz on Buzzfeed, but I assume in person it’s way more fun? Details: There will also be a superhero photo opp (you in front of a background) and a chance to buy comic books. Your opportunity to get dem GoTG goods. Another nearby store, the Studio Store, will carry more Marvel-themed stuff. You know the drill. Obviously this is not a new ride — in fact, it’s the opposite. The classic version of this ride, which turns a healthy 40 years old this Saturday, returns June 1 after a stint as Hyperspace Mountain. The Star Wars-themed overlay was part of Disneyland’s Season of the Force promotion, which took over Tomorrowland in 2015. The classic version will run until the Space Mountain Ghost Galaxy overlay takes over during Halloween time at the park, which starts in September. Again, this one is not new so much as a return. You’ve probably seen the commercials for the return of the Main Street Electrical Parade, which made its return to Disneyland in January of this year. The MSEP was a very popular parade at Disneyland from 1972 to 1996, when it was moved briefly to Disney World before coming back to California in 2001. It then ran from 2001-2010 at Disney California Adventure before being shuttled back across the country to Florida, and then again to California for its limited-run engagement at Disneyland. That’s right, the Electrical Parade is here for only a short while – until August 20, 2017, to be exact. This day-time parade down Main Street U.S.A. was on hiatus but has recently returned. This is a fun, musical-themed parade (aren’t they all?) featuring your favorite characters, including Mickey, Minnie, Donald, and Mary Poppins, who is the best. Check the Disneyland app for parade times. This cute, Pixar-themed parade went on hiatus in 2016 to accommodate the Food and Wine Festival at DCA, but is now back. If you love Buzz, Woody, Flik, Sully, or any of the Incredibles, this is the parade for you (I love it). Again, check the app for times. This spring, two attractions were added to the FASTPASS system: Toy Story Midway Mania in DCA and the Matterhorn. If you don’t know, FASTPASS is a ticket system that allows you to essentially save your place in line. You show up to a FASTPASS-enabled ride, look for the ticket distribution kiosk, insert your admission ticket, and out pops a ticket telling you to come back at an assigned time later in the day. What’s also new to the FASTPASS system is that you can only enable one FASTPASS at a time per park. Before, you could get a FASTPASS at Disneyland and then walk over to DCA and get one there. Not anymore. Now, you won’t be issued another FastPASS until your assigned ride time, or two hours from when you were issued the FASTPASS — whichever comes sooner. Later this year, Disneyland and DCA will start employing something called MaxPass, which will allow you (at a cost of $10 per person per day) to reserve a FASTPASS from anywhere within the park on the Disneyland app. This means, if you want a FASTPASS to Space Mountain, you can reserve one on your phone from Main Street without having to walk all the way over to Tomorrowland for a paper ticket (though paper FASTPASSES will still be available for those who don’t want to pay the $10). No official word yet on the launch date of MaxPass, but you can already see the scanners installed at many of the FASTPASS locations, so it won’t be long. In 2016, Honda became the official sponsor of Autopia (the previous sponsor was Chevron). At that time, the cars were repainted to reflect colors of Honda cars. In April of this year, a little more flair was added to the ride in the form of Asimo. Remember Asimo? He was the walking robot that appeared in Innoventions (which is currently Star Wars Launch Bay for those of you playing along at home). This is probably my favorite thing returning to the parks. Since 2015, the Rivers of America has been mostly inactive due to this construction. Certain attractions and shows have been closed, including the Disneyland Railroad, the Mark Twain, the Columbia, Pirate’s Lair at Tom Sawyer’s Island, Davy Crockett’s Explorer Canoes, and Fantasmic. However, earlier this month, Disney announced that Fantasmic! will return on July 17 — with some changes. Aladdin and Jasmine will now be appearing on their magic carpet during this night-time show. The rumor is that they are replacing Pinocchio and his marionette friends. Also rumored to go: Snow White and Prince Charming, who will be replaced by characters from Tangled, and Peter Pan and his crew, who will be replaced by Pirates of the Caribbean characters. Also, The Lion King has been added to the show. Pirate’s Lair at Tom Sawyer Island is now re-opened. The rest of the river attractions — and the Disneyland Railroad — will be back in action on July 29. I tried the gray stuff. It’s delicious. Earlier this year, the Village Haus restaurant in Fantasyland was re-themed to coincide with the premiere of Disney’s live-action Beauty and the Beast. The restaurant got a new menu and all-new décor — a welcome change, in my opinion. The Red Rose Taverne is still operating, so far with no announced end in sight, so if you want to “try the gray stuff,” get there before it magically changes back to the Pinocchio-themed pizza joint it used to be. Bengal Barbecue in Adventureland has added a pork belly skewer to its menu. It features Hoisin sauce, picked carrots, daikon, and cilantro, and is pretty tasty. If you love the Dole Whip Float but wished it was boozier, you’re in luck. The coffeehouse located at the Disneyland Hotel is now serving a Dole Whip Float with a splash of rum in it (FYI, you don’t have to be a guest of the hotel to visit). Being someone who knows a little something about drinking at Disneyland, I made sure to try it. If you feel so inclined, you can watch my reaction to this drink here. And there you have it: everything that’s arriving at, or returning to, the Disneyland Resort in summer 2017. Remember to download the Disneyland app before you go (it’s free and will come in handy), and make sure to check ticket prices. What are you looking forward to most this summer? For me, it’s a toss-up between Fantasmic! and classic Space Mountain. If you’re looking for a unique activity over Memorial Day Weekend, you’ll find it in Coalinga. A small town nestled in the hills, it might not seem like the first choice for adventure. But every May, this town is home to the Coalinga Horned Toad Derby, an event full of fun, food, and of course, horned toads. Coalinga has been hosting the Horned Toad Derby for 81 years with no plans of stopping. How does a town begin racing horned toads, you ask? Long ago, some teenagers were bored at an annual Chamber of Commerce dinner meeting. Since it was 1933, taking selfies to stem their boredom wasn’t an option, so they did the next best thing: they rounded up a bunch of the local lizards to race — that’s right, a horned toad is actually a lizard; try to keep up — and a tradition was born. By 1938, it was all about the horned toad. There was even an official California Horned Toad Racing Association. Celebrities, who always know a cool thing when they see it, jumped in on the action. In 1941, Bob Hope raced a horned toad. I have no idea if he beat Rudy Vallée or not, but toad racing was trending. And guess what, folks? The Coalinga Chamber of Commerce has a permit to have horned toads in their possession. How many cities can say that about their Chamber of Commerce? I’m guessing just one. So every year, they go up to Howell Ranch to catch the toads for the derby. They mark the exact spot where they were captured, so after a really exciting weekend, the toads are returned to the same place. These toads are beloved, and the city wants to ensure they’re well taken care of and back in their natural habitat. A crowd gathers for an exciting race at the Coalinga Horned Toad Derby. Photo courtesy of the Coalinga Chamber of Commerce. Personally, you had me at horned toads, but if that isn’t enough to get you out to Coalinga this weekend, there’s more. Not only can you watch the toad races, you can enjoy food, drinks, and even a cow drop contest. Not to be outdone by the cows and toads, the First Presbyterian Church will hold a watermelon seed spitting contest on Monday. There will also be carnival rides, beer gardens, craft vendors, and food including Rosa Brothers Milk Company ice cream. Finally, be prepared to dance your socks off to live music ranging from Jeremy “Elvis” Pearce and the Memphis Band to Mariachi Uruapan. Admission and parking to the derby is completely free, although the experience is guaranteed to be priceless. Enjoy family fun after the toad races at the Coalinga Horned Toad Derby. I know it seems like Coalinga has taken something unusual (horned toad races) and doubled down with every small town activity in history, but they’ve done even more than that! I haven’t even begun to cover things like the parade, adult tricycle races, and the whiskerino contest. What can I say, I didn’t want to overwhelm you. The point is, Fresno is an hour-and-a-half away from a guaranteed awesome weekend. If you decide to check out the 81st Horned Toad Derby, I bet you aren’t going to forget it! Location: All events take place Friday-Monday, May 26-29, at Olson Park, 400 N. Garfield St., Coalinga, CA 93210. Cost: Admission and parking is free. Friday events are from 3 p.m. to 11 p.m.
Saturday at 7 a.m. is the Fireman’s Pancake Breakfast. At 10 a.m., the parade winds through town. At 11 a.m. the derby continues and ends at 11 p.m.
Sunday, events begin at 12 p.m. and end at 11 p.m.
More information: The Horned Toad Derby Facebook event page is here. The Coalinga Chamber of Commerce website is here, or you can call (559) 935-2948 for more information. Last week, ValleyPBS, Fresno’s local PBS station, celebrated its 40th anniversary. Originally founded by the Fresno County Office of Education with donated equipment and a grant from the federal government, and operating under the call letters KMTF (stood for Kings, Madera, Tulare and Fresno counties), the station now known as KVPT (Valley Public Television) has a long, rich history of serving Valley viewers. ValleyPBS celebrated its 40th anniversary on Wednesday, April 12. • Originally located on L Street (in the former KFSN 30 building), ValleyPBS moved to 1544 Van Ness in 1990, purchasing the building from KSEE 24 for $1 (and the land for $25K). • The station has had just three CEOs: Colin Dougherty from 1977 to 2003, Paula Castadio from 2003 to 2015, and Phil Meyer from 2015 to today. • “The Great TV Auction,” a live auction show, became a well-known, highly viewed, annual fundraiser for the station, and it took hundreds of volunteers to pull off the show each year. Auction items included everything from rugs to vacations, tools, and even livestock. • Local programming has been a focus of the station since its start with both weekly series and one-time special programs being written, produced, and aired right from the local building. • The station held a capital campaign and fund-raised for a full decade to make it happen, but when the time came to go from analog to a digital signal, ValleyPBS converted successfully. • ValleyPBS is a member-supported, independent, non-profit television station that raises 80% of its own operating budget. Only 20% of funding for the station comes through government sources such as the Corporation for Public Broadcasting. • The cost of funding PBS television stations’ government allocation is only $1.37 per tax payer, per year. • PBS is the 5th most-watched network (broadcast and cable considered) in the country, and locally, viewership of ValleyPBS is nearly double the typical PBS viewership rate of other cities across the country. • 82% of Valley children who are preschool-aged are unable to afford to participate in a quality, preschool program. Though many subsidized preschool spots exist, most are half-day and do not work for families with working-class parents, as parents typically can’t leave their job midday when the preschool day ends. Because of this, ValleyPBS commits 70 hours of air time each week to quality, educational, PBS Kids shows so that children who are unable to attend preschool can still learn the necessary reading, math, science, and social skills needed to enter kindergarten prepared for success. • ValleyPBS is a public television station, therefore it presents balanced and fair information on all topics, and does not (cannot, and will not) allow any of its programming to be influenced by commercial interests or biases. • ValleyPBS is largely supported thanks to the generosity of the 11,000 local viewers and fans who have made the commitment to help support the station’s ongoing operation by providing a financial donation either monthly, annually. or through larger, one-time gifts. Proud ValleyPBS staffers gather at the 40th anniversary event, including producer Oscar Speace (back center), who’s been with the station over 35 years. • ValleyPBS Learning Media is a free, online treasure trove of over 100,000 media items such as show clips, full-length episodes, audio files, printable curriculum, interactive PC and white board games, and more just for teachers and educators. Teachers can search by topic, Common Core Standard and grade level, and save items they’d like to use in their classrooms to their favorites folder. • ValleyPBS Family Circle is a membership program specifically for parents of young children. For a monthly, tax-deductible donation of $10 (or more), families can enjoy exclusive access to special monthly events and activities at no additional charge. The station partners with local children’s attractions such as Rotary Storyland Playland, Imagine U Children’s Museum, The Chaffee Zoo and the Fresno County Public Library to host Family Circle members for hands-on learning, tasty snacks (provided by Whole Foods), crafts, and character meet and greets. The affordable monthly donation is more than offset when family members attend the events. For example, last October, Family Circle members enjoyed a day at the Pumpkin Patch on First and Nees complete with pumpkins for each child, a story time, snack, and free unlimited ride wristband, all at no additional cost. To join Family Circle, click here. • ValleyPBS Ready to Learn is an outreach program offered through partnerships with local school districts that provides parents of preschool- and elementary-aged children a chance to get together with other parents and learn practical ways to help their children succeed in the classroom and life. ValleyPBS has a team of 30 dynamic and motivating trainers who teach parent workshops in English, Spanish, and Hmong at schools throughout the Valley in the mornings and evenings. These workshops are free for parents to attend and include children’s books, hands-on projects and school supplies, childcare, and breakfast or dinner for the families attending! As of this week, ValleyPBS has offered 330 parent workshops and counting — just this school year! To follow their schedule of workshops so you can participate, check out the ValleyPBS Parents Facebook Page. • Local Production and Video Production Services. ValleyPBS continues to produce its own local content, both in house and in collaboration with local talent. Valley’s Gold, the station’s weekly program that takes you from farm to table through a different crop each week, is produced by ValleyPBS staff in partnership with the Fresno Farm Bureau, and the station is currently working on three big, stand-alone projects which include a documentary about water (watch the water show’s trailer — it’s awesome! ), one telling the powerful stories of Japanese Americans who endured the hardships of internment camp life in the Valley, and one that tells the tales veterans and soldiers sharing their stories of service. ValleyPBS also offers fee-for-service video production for outside clients from project start to finish at prices that are often below local commercial studio rates. • Share this article with others and tell them why ValleyPBS is important to you. • Become a member and provide an ongoing donation or one-time donation. For as little as $5 a month, deducted automatically, you can become a Sustaining Circle Member and make a significant contribution to the health of the station. • If you’re a school administrator, consider inviting ValleyPBS’s Ready to Learn program on campus to provide parent engagement services. Not an administrator, but close to one? Make sure they know about Ready to Learn. • Eat pizza. Yup! By simply eating at any local-area Pieology on Thursdays in the month of May, and showing the flyer below (printed out or on your mobile device) you’ll be contributing 20% of your meal price to ValleyPBS! Station employees also support the station. Many are members, and several gathered last Thursday to buy lunch at Pieology when the restaurants hosted their first ValleyPBS benefit day. Disclaimer: The author of this article is an employee of ValleyPBS who grew up watching channel 18, Sesame Street, and Mr. Rogers, and who loves her job. That said, the information contained here is very much firsthand, so you can count on it its accuracy, too. Clovis is generally considered to be very peaceful and quiet. In fact, it’s been called the number one city in which to raise a family in California. However, there’s one bank in town that gets robbed Every. Single. February. Thankfully, it’s just a melodramatic reenactment of the Great Bank Robbery of 1924 and not the real deal. Still worth watching, though. If you want to watch some old-time criminal history, stop by the Clovis-Big Dry Creek Museum this Saturday, because it’s time for the Lone Wolf and the Owl to make their annual appearance. In the early days of the town, the Clovis-Big Dry Creek Museum was the Clovis Bank. One exciting day in 1924, two men with interesting nicknames walked inside and robbed the bank at gunpoint. The Lone Wolf (Felix Sloper) and the Owl (Thomas Griffin) made off with $31,000, despite being chased by the town’s Sheriff. They sprinkled nails in the road to escape, which heretofore I didn’t think would be effective. Clearly, I’m no expert. The money was never recovered, but both robbers eventually met untimely demises. The museum has photographs of the bank, and the vault still stands, now holding Clovis’s precious memories in yearbooks and other documents. In addition, the bank has a revolver and a nail from the getaway on display in a case surrounded by sheriffs’ badges. Naturally, the Clovis-Big Dry Creek Museum is not only about the Great Bank Robbery of 1924. You could spend a whole day inside learning about local history. Recently, I enjoyed a fabulous museum tour by Docent Marian Prindiville, who is knowledgable and friendly, and offered my kids a free pen to remember their visit. Marian walked us through the museum and explained the history behind the photographs that line the walls, as well as some of the museum’s other artifacts, including a piece of the great flume that went all the way from Shaver Lake to the Clovis rodeo grounds. Seeing the photographs of rows of lumber where the rodeo grounds are now really shows how different Clovis is, 100 or so years later. The museum also houses a section featuring artifacts from the indigenous Yokut people, and a wall dedicated to the city’s founder, “Wheat King” Clovis Cole. My sons loved the Veterans’ Room, which had uniforms and photographs of local heroes who have served our country. There’s also a Heritage Room that houses outfits of yore, including some very fashionable bonnets. And of course, there’s an area dedicated to “Gunsmoke” actor Ken Curtis (he played Festus Haggen), who lived out his later years in Clovis. 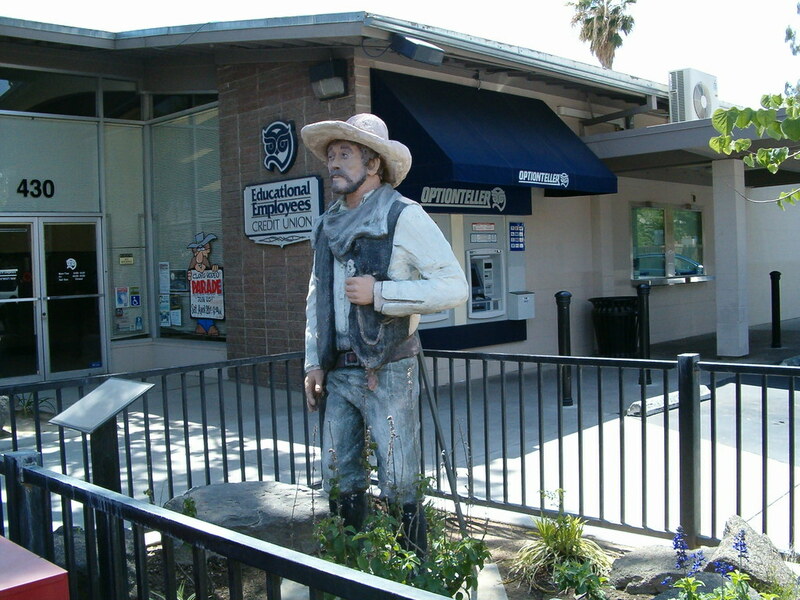 Did you know the cowboy statue in front of the Educational Employees Credit Union on Pollasky Ave. is his likeness? I had always thought it was a random cowboy, but you learn something new every day, especially if you go to a museum with an informative docent. After visiting the museum, I feel like I have a better connection with Clovis. It’s always grounding to know where a place has been and what sort of adventures have happened on the streets we currently walk on. From revolvers to bonnets, there’s really something for everyone at the Clovis Dry-Creek Historical Society Museum. A museum display of a wide variety of barbed wires, just one of the interesting collections within. Pajamas? Check. “Choo-choo” obsessed toddler? Check. With that in mind I walked into Barnes & Noble last weekend with my kiddo in tow. They had an official storytime event going on, a pajama party reading of “The Polar Express”. As soon as we walked through the door, we were greeted by a very enthusiastic train conductor, resplendent in full costume and character. He helpfully directed us to the children’s section in the back of the store. Alexander and I, gearing up for Storytime. There were already tons of kids there, engaged in the preliminary and very exciting process of writing their letters to Santa Claus. As soon as they finished, they were given an activity packet complete with a little silver jingle bell, so they could ring it at key points during the story. It was a really fun and surprisingly low-key evening. Hunter, the employee who does the children’s readings, is very warm, friendly, and animated. She was very much in the spirit of things, even rocking her own Batman onesie pajamas. To get everyone in the holiday mood, we sang a couple of Christmas songs accompanied by ukulele, and then the story began. Is anything cuter than seeing a room full of kids in their Christmas PJ’s, completely wrapped up in a story book? If so I don’t want to know about it. The reading was engaging and entertaining, the “train conductor” got to chime in at key points, and the strategic silver jingle bells got quite a workout. Of course, I’d tempted fate by keeping my son up long past his bedtime, and bribing him with (super Christmassy) bananas and pretzels only got us so far. In order not to disrupt the festivities, we ended up having to scurry home before the post-story cookies and the snowflake decorating activity. (Pretty sure every parent has been there at some point!) Luckily he was already in his pajamas so bedtime was a snap. Hunter’s ready for Grinch time! We went back the next day to check out Hunter’s reading of “The Grinch Who Stole Christmas”, because who can resist Dr. Seuss? I’m not sure if I can claim that my “heart grew three sizes that day”, but it definitely served as a much needed boost for my holiday spirit this year. Once again, cute activities, a fun listening experience for parents and kids alike, and my tiny “Who” was thrilled to get his own Grinch-themed pin back button and a sticker. Two FresYes thumbs up! Go early. I know, this is a no-brainer, but- just in case you need extra motivation- there’s not a ton of seating. Also, much of what’s there is kid sized. Wear comfy clothes/shoes because grownups, you may end up sitting on the floor or leaning against a bookcase for the duration. Also, you might want to wear layers! I’ve been to B&N, several times over the last few weeks, and every time it’s been on the toasty side. Nobody wants to be desperately sweating or stripping in the middle of a children’s story hour. Hopefully. Definitely don’t Grinch out because you missed these first two storytime events! Check out these upcoming holiday children’s story readings coming up at Barnes & Noble for the rest of December. Free, fun, local holiday activities- what are you waiting for? 11 AM: “If You Give a Mouse a Cookie” Storytime Special Event. 12 PM -2 PM: Linda Lee Kane Author Event. (Children’s) Book signing of “Cowboy Jack & Buddy Save Christmas”. 11 AM: “Hap-Pea All Year” Storytime Special Event. More info available at the Fresno Barnes & Noble Events Page. Have fun!